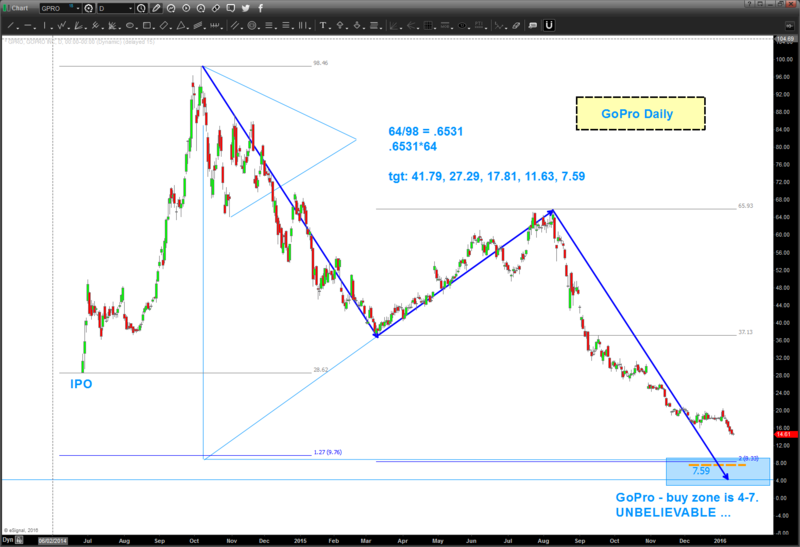 GoPro Stock Price Craters: Where Will GPRO Bottom? It’s been a roller coaster ride for GoPro (GPRO) stock investors. Since the IPO, GoPro’s stock price surged higher (almost hitting $100 per share), before falling all the way down as low as $11.26 per share today. Every time analysts or traders seem to call for a GPRO bottom, it seems to evade them. To recap: GoPro’s all-time highs came in October 2014 but it’s been downhill since then. Despite a couple of countertrend rallies, GoPro’s stock has made lower lows and disappointed investors. But, the saga surrounding GoPro stock could be coming to an end… so where will GPRO bottom? It certainly looks like the lows around $36/$37 are going to break to the downside. If/When this happens, we should roll into the $27-$29 area. That “should” be pretty strong support … if we lose that level, then look for a move all the way down into the single digits. Well, guess what, in after hours trading yesterday the stock came very close to breaking into single digits. I’m a price pattern recognition guy, so that’s what I focus on. Very cool product, but the stock price patterns provided clues along the way. If the current pattern completes, I expect a GPRO bottom to come in around $7, with a GPRO bottom “range” around $4 to $8.